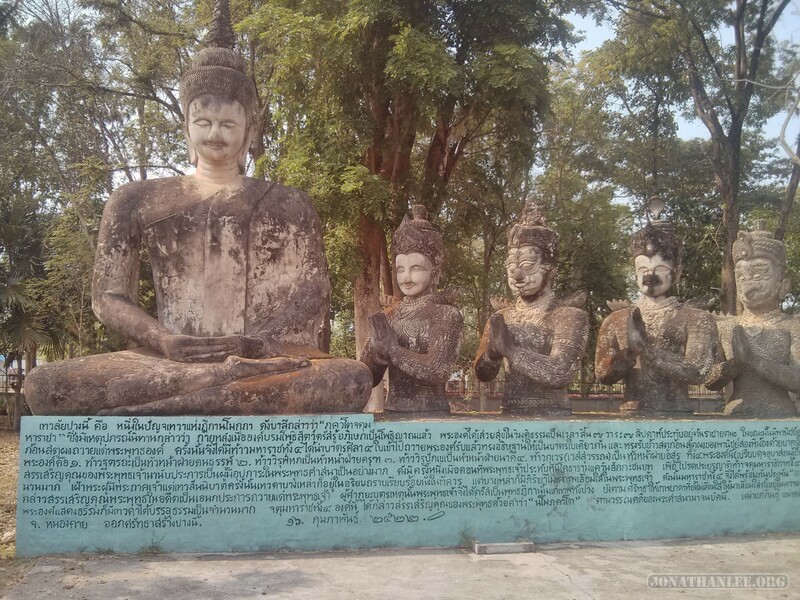 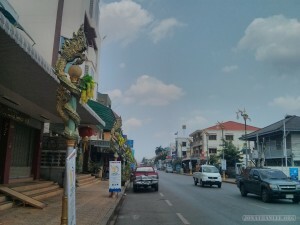 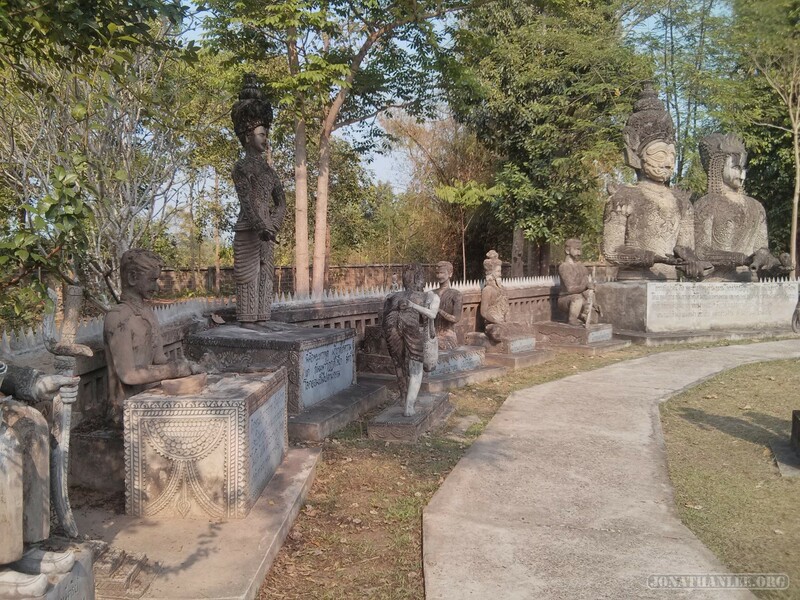 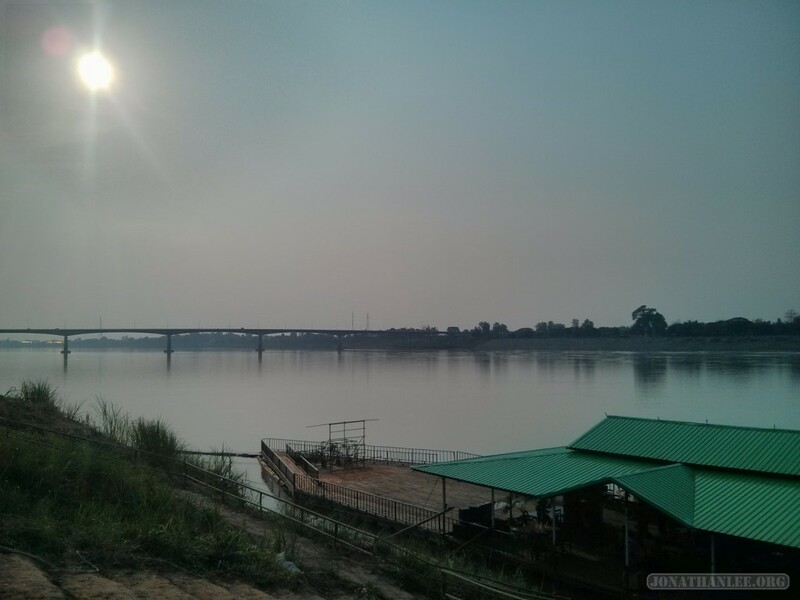 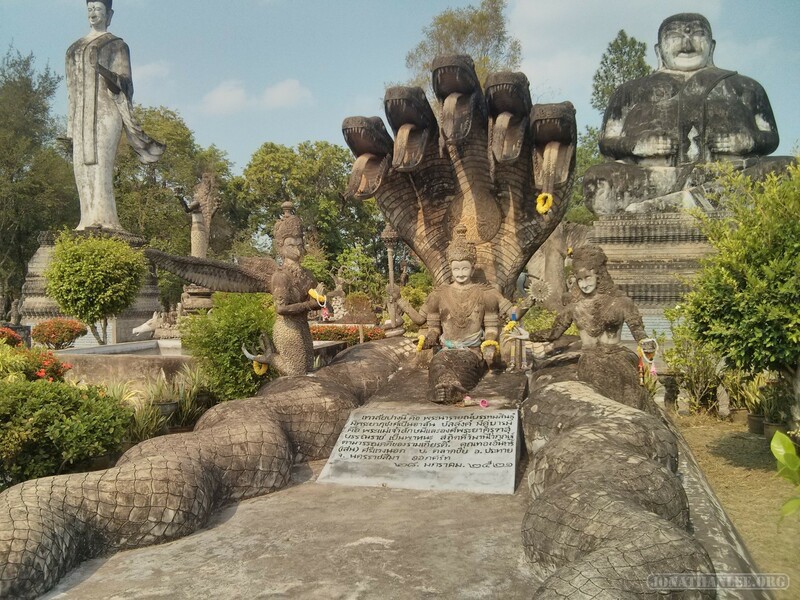 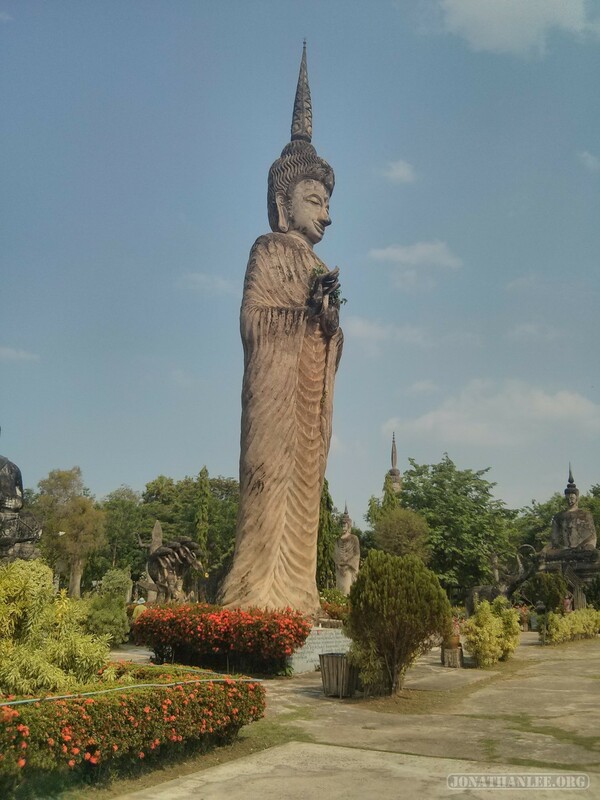 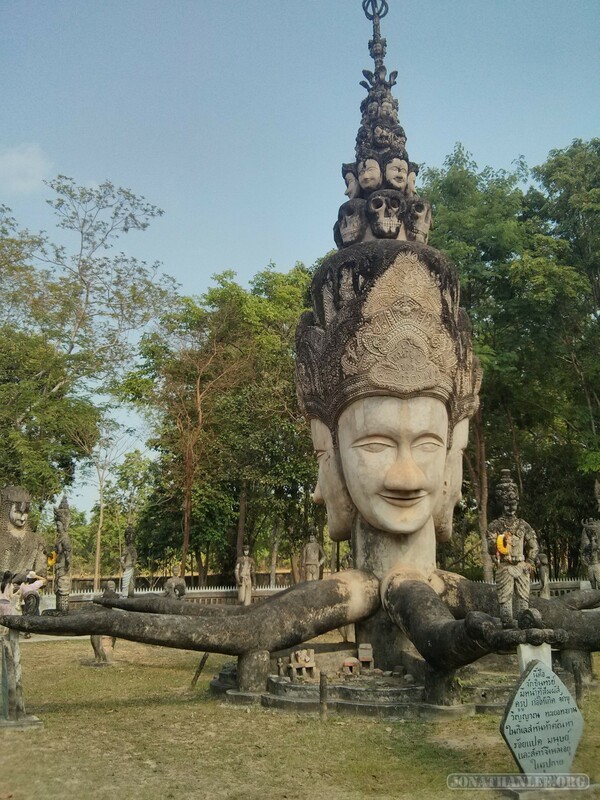 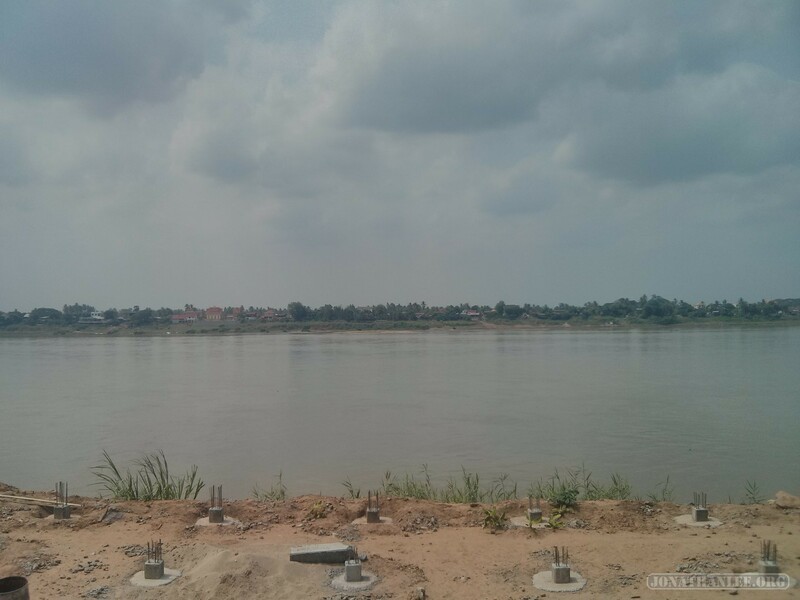 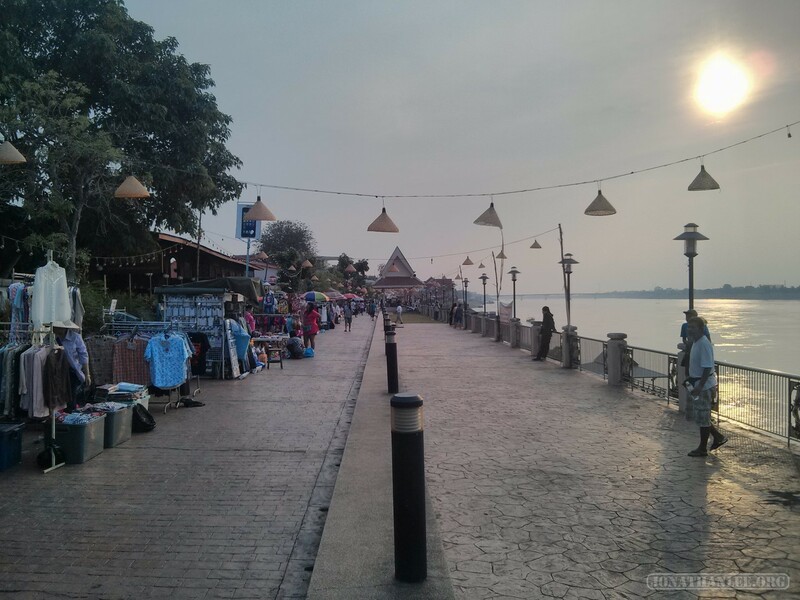 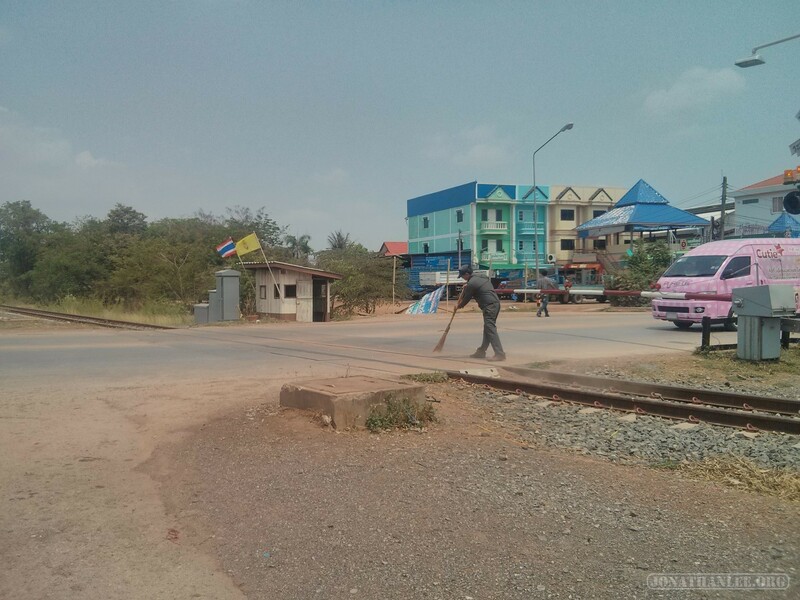 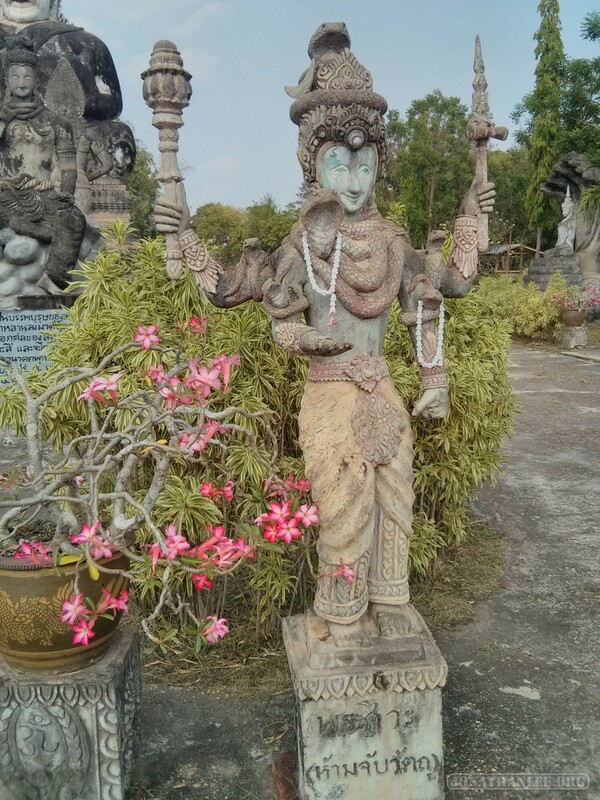 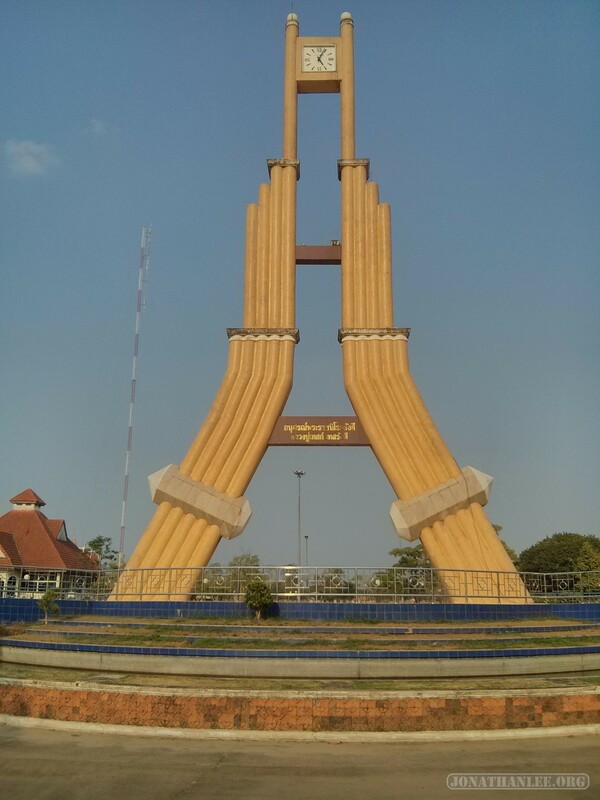 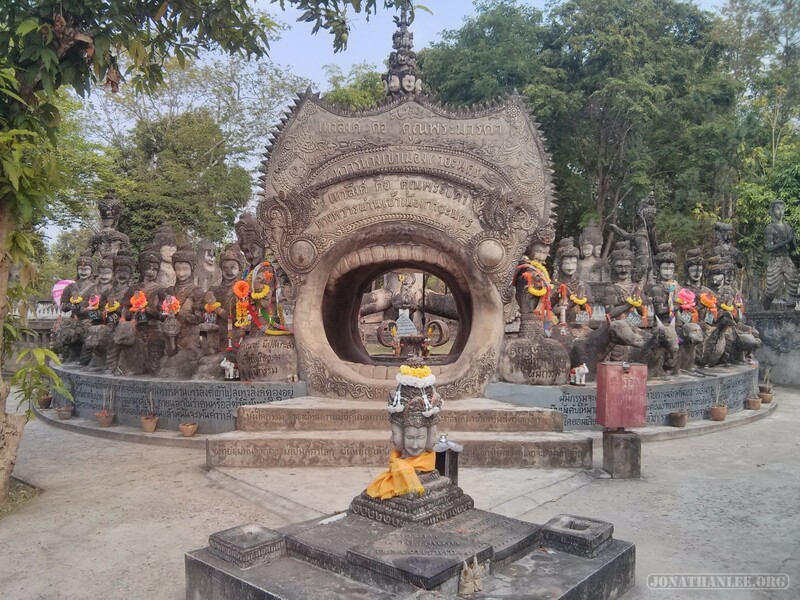 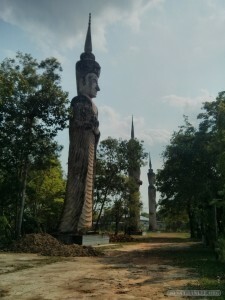 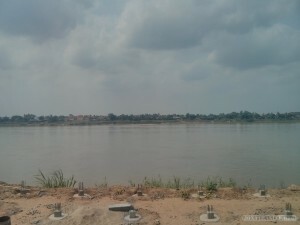 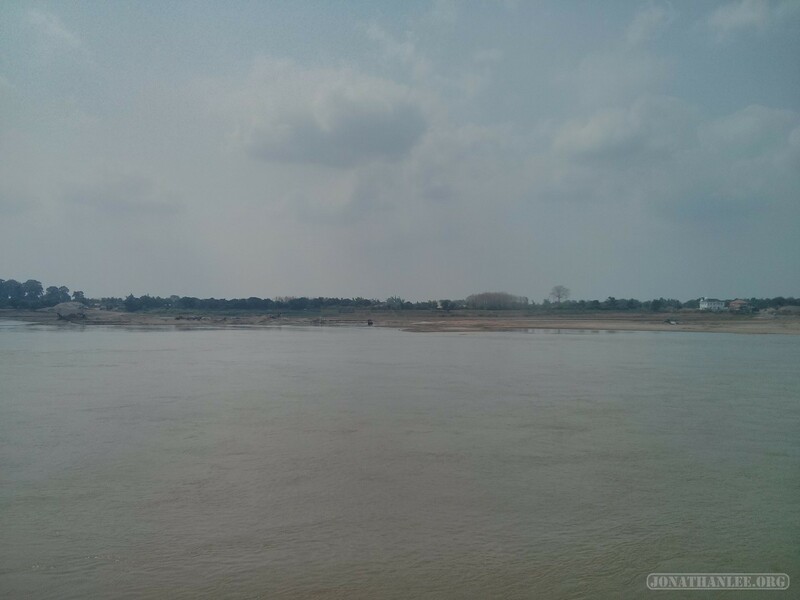 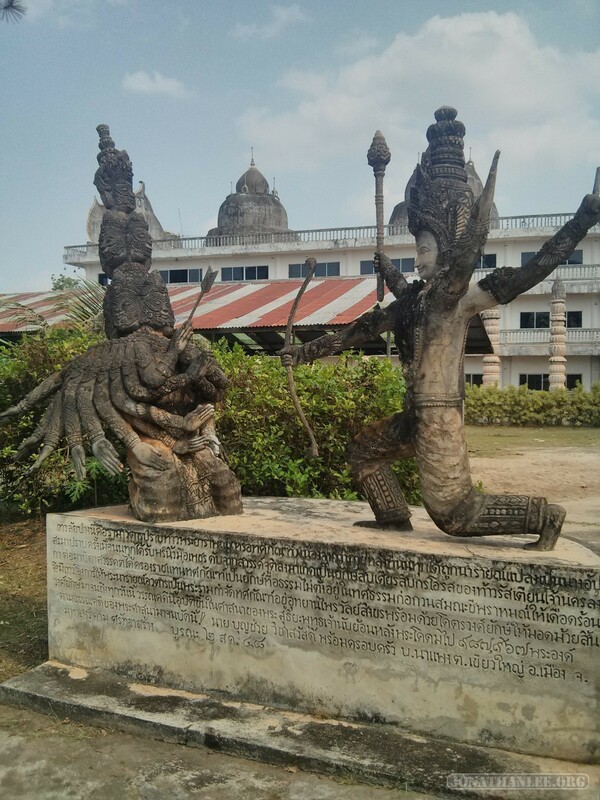 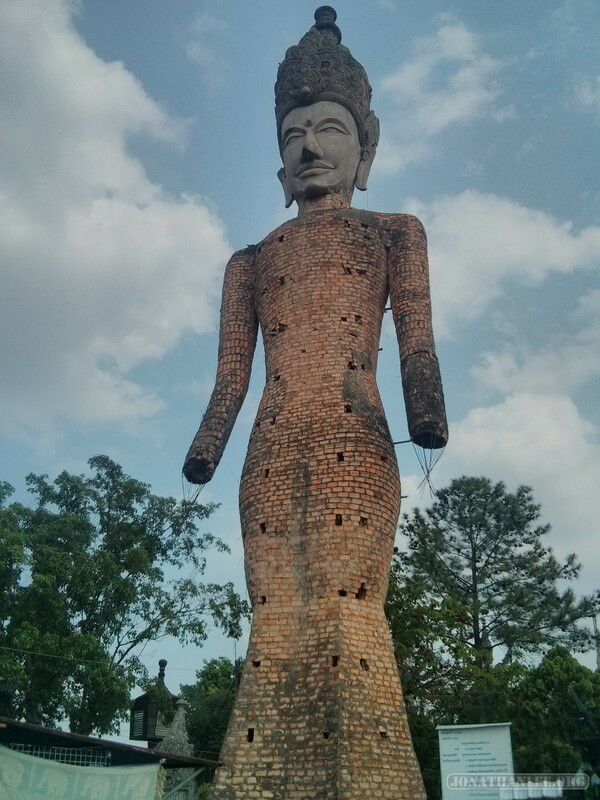 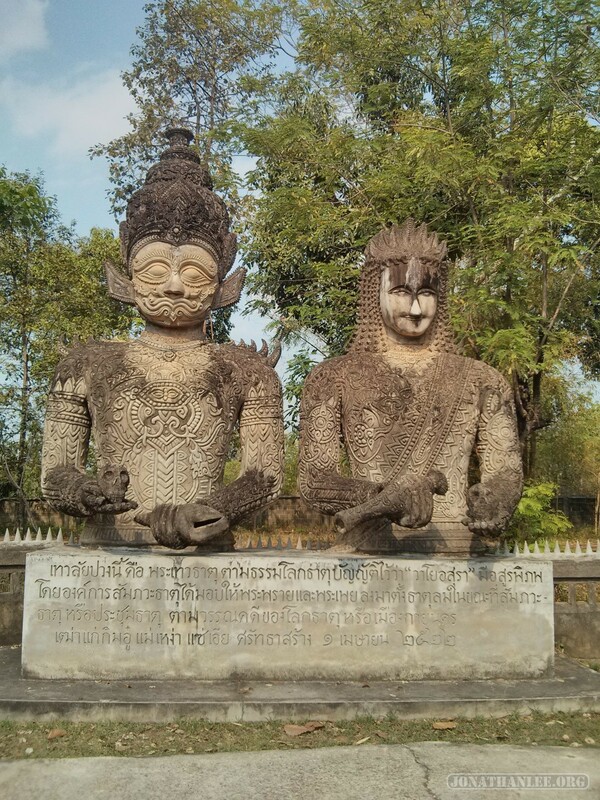 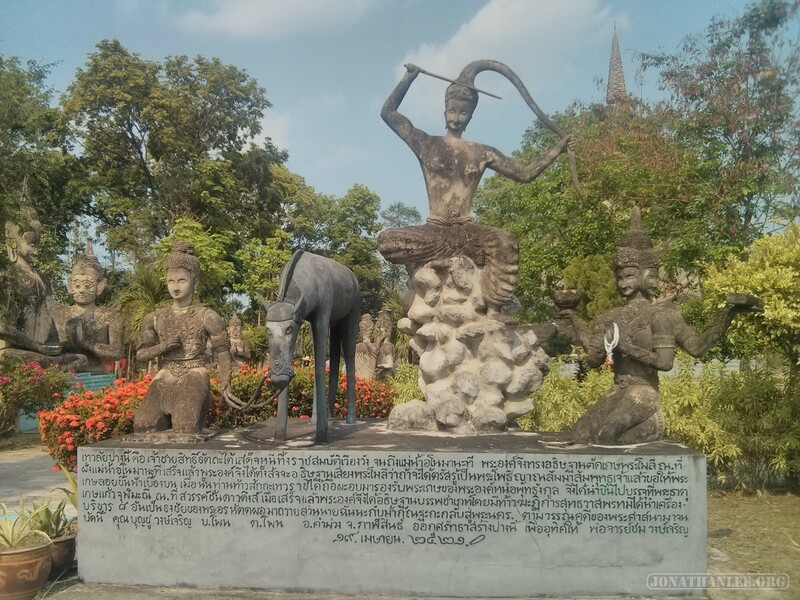 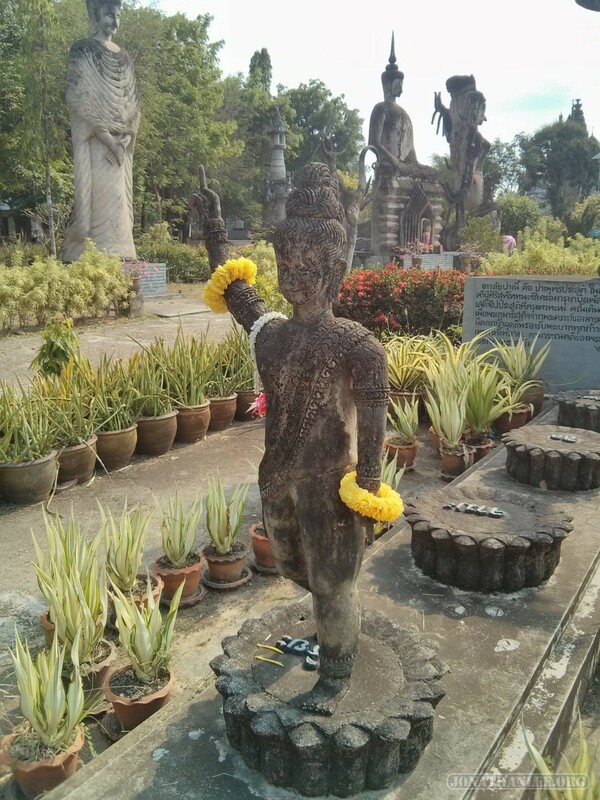 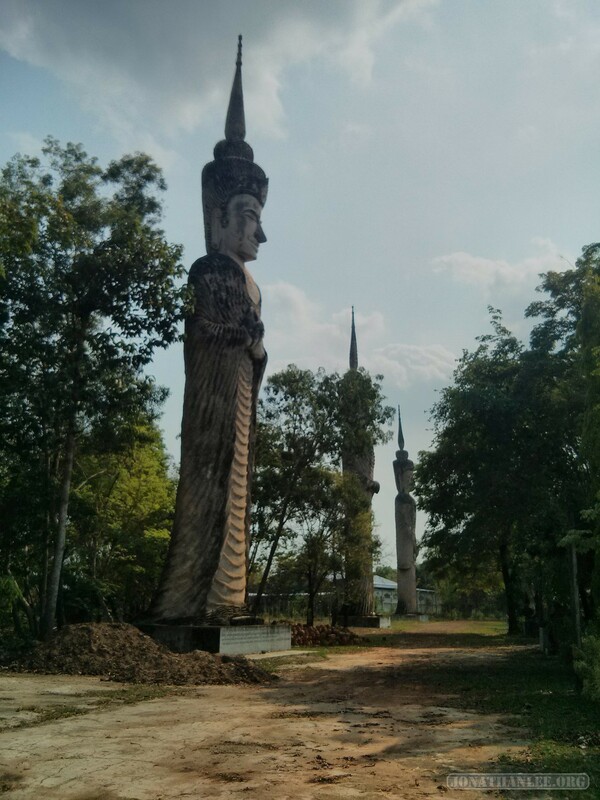 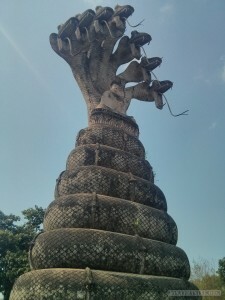 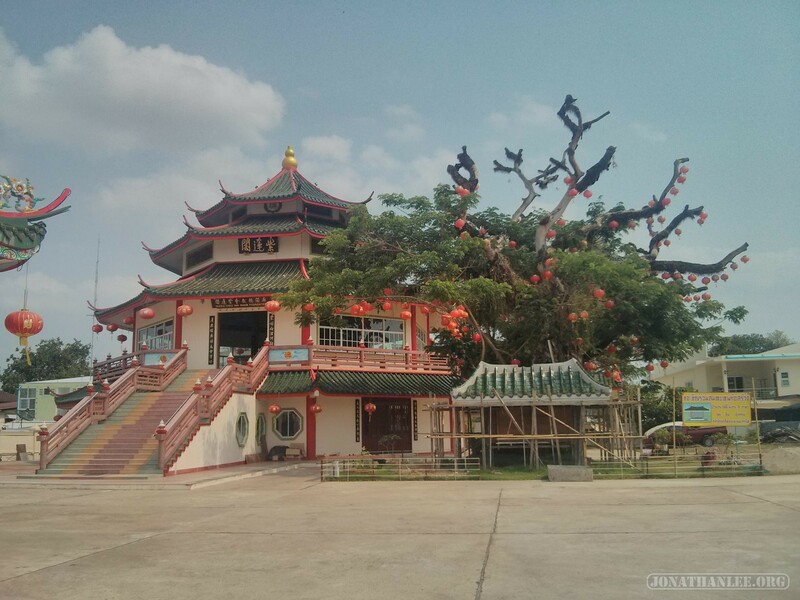 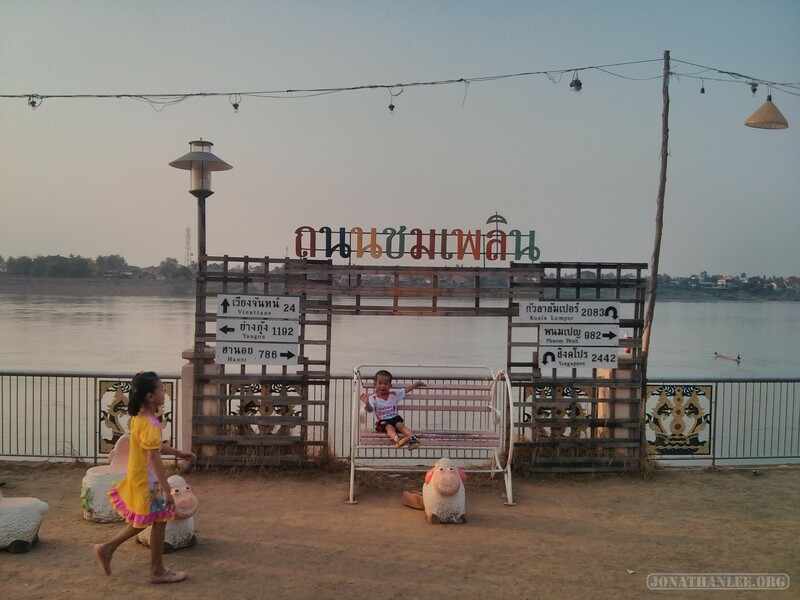 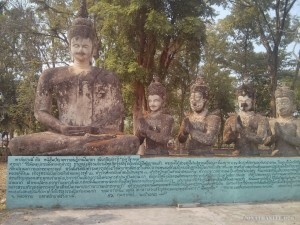 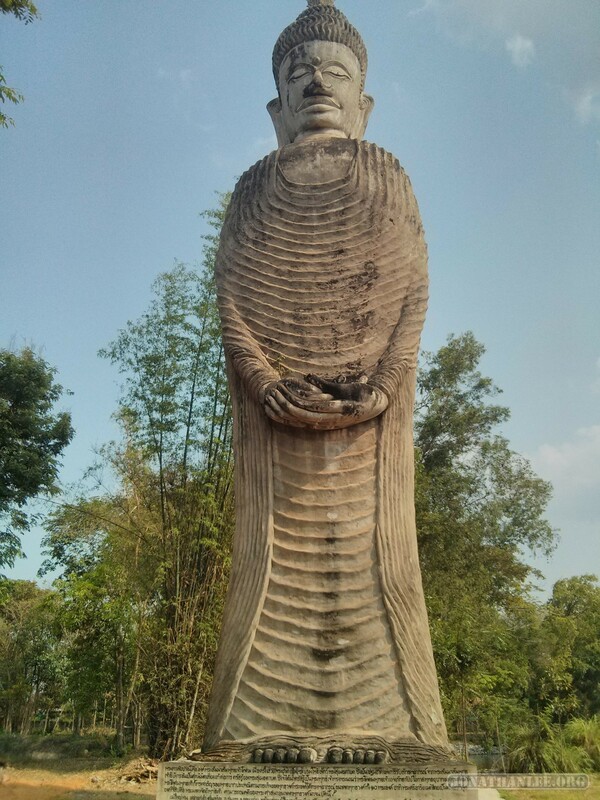 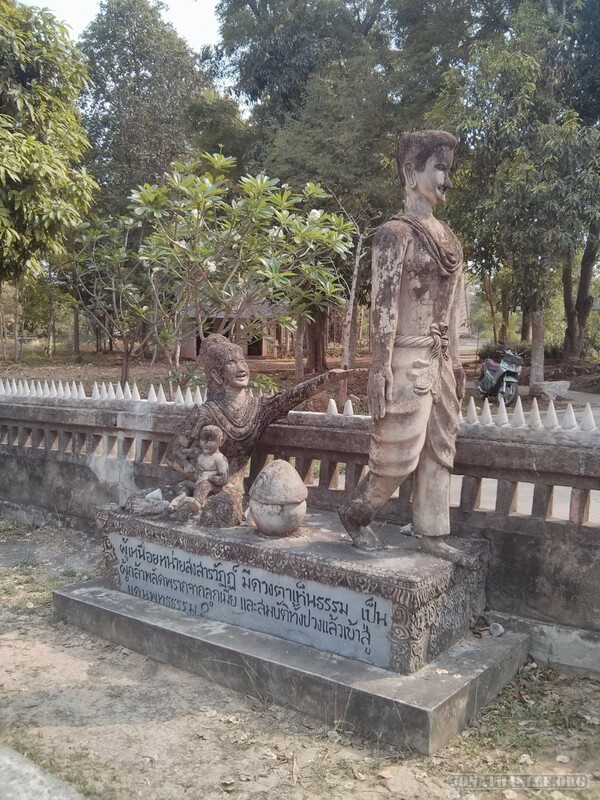 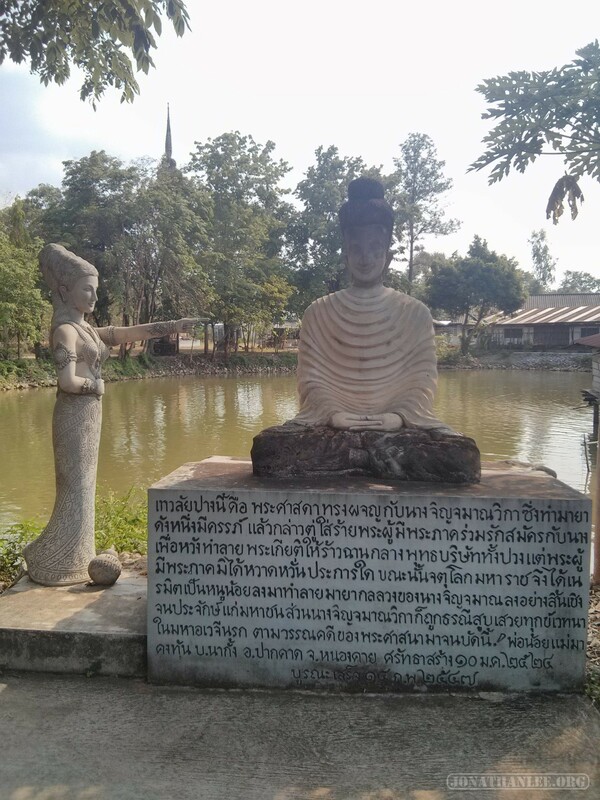 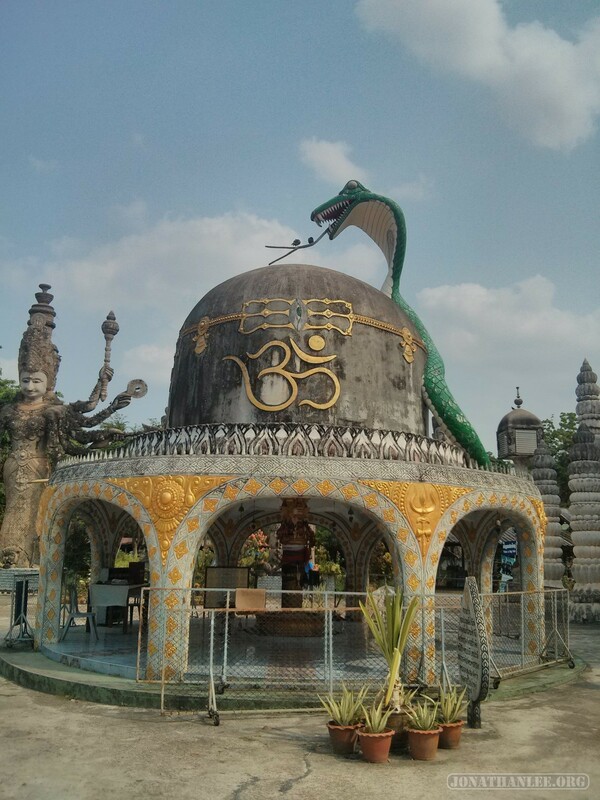 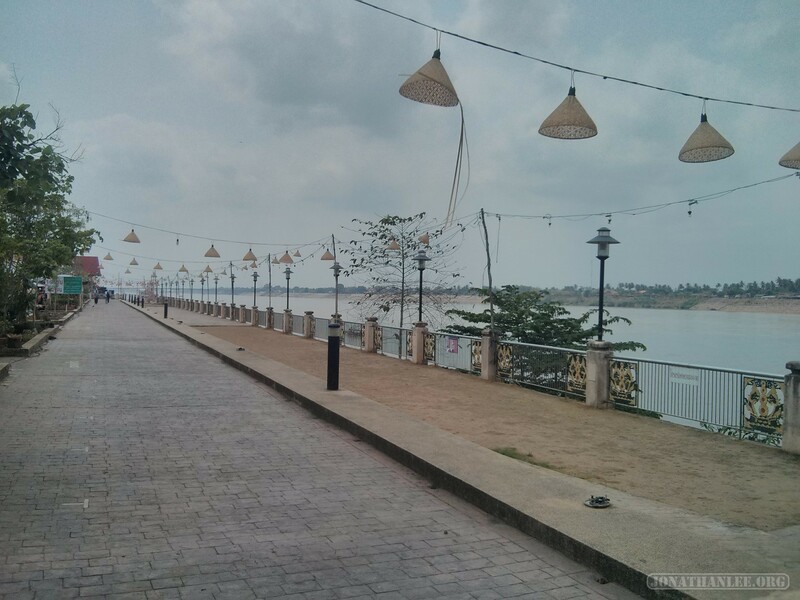 Like Vientiane, Nong Khai is a pretty relaxed city, with not much to do and see (with one exception, Sala Keoku). 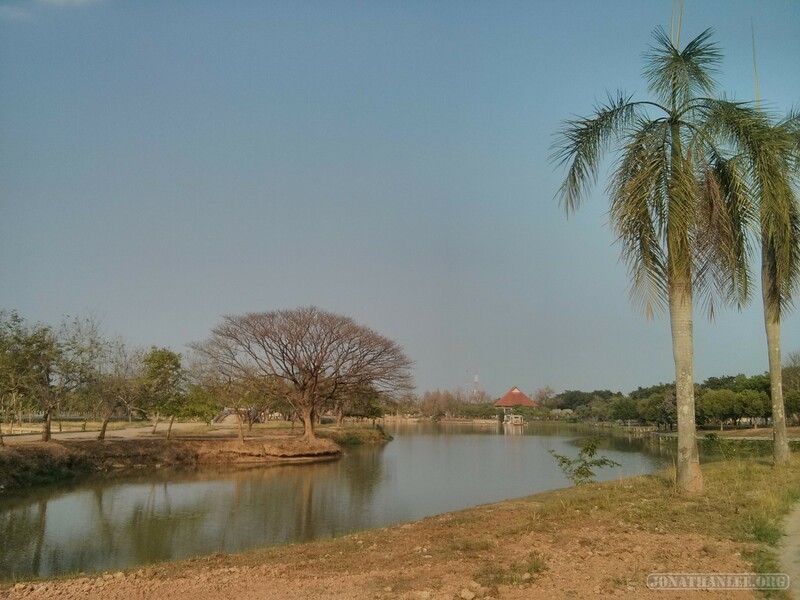 So while waiting for the train, I got myself a bicycle, and just pedaled around exploring this city. 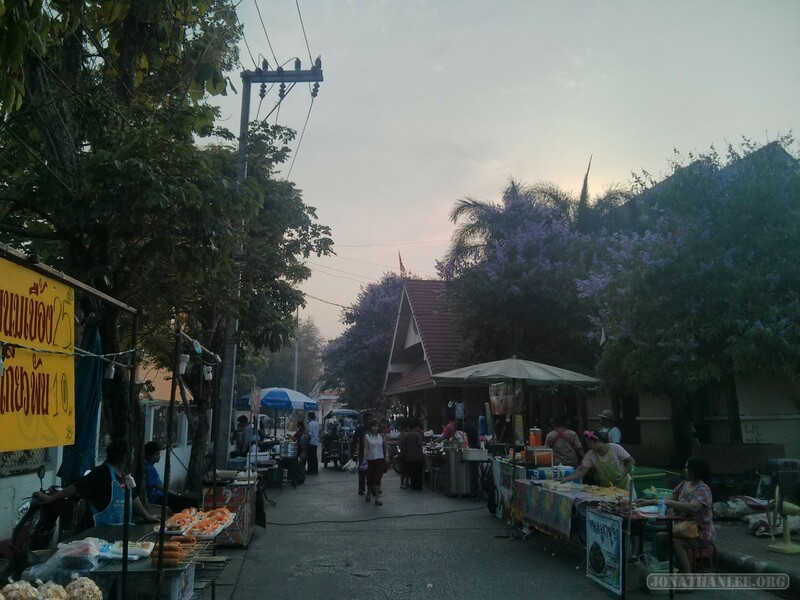 Compared to Vientiane in Laos, it’s a lot more developed, a lot more lively here. 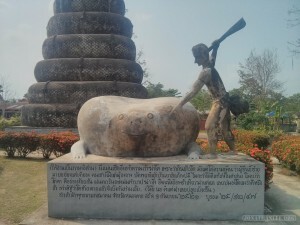 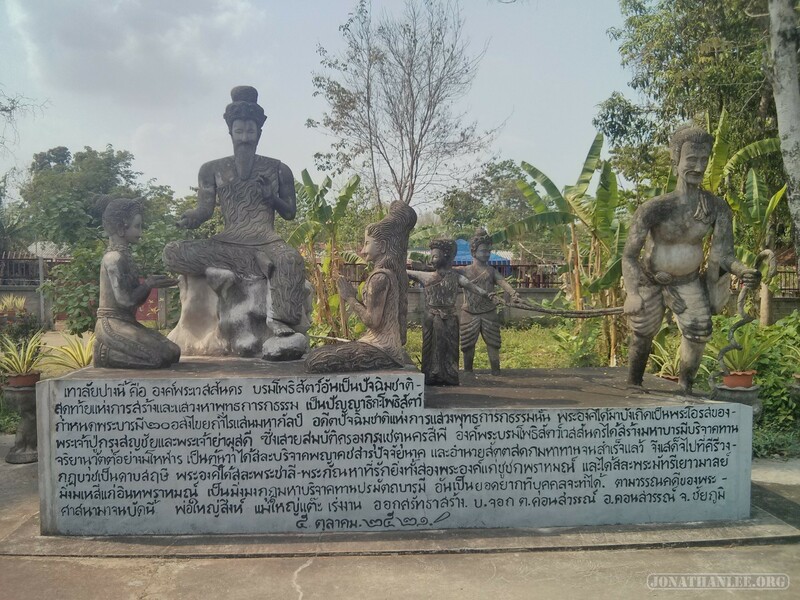 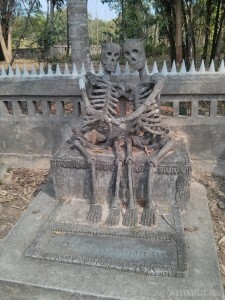 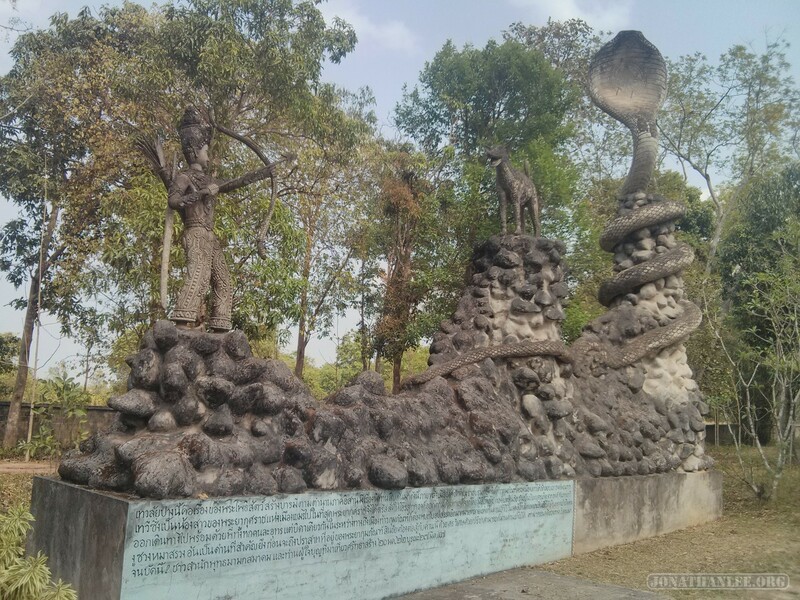 Sala Keoku: it’s a surreal sculpture park, within biking distance from town. 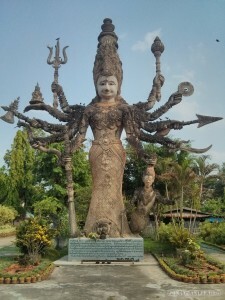 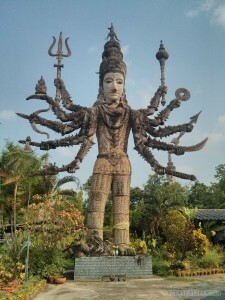 No other way to describe it, it’s a large park, filled with enormous sculptures. 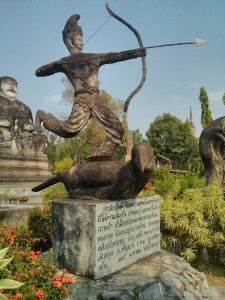 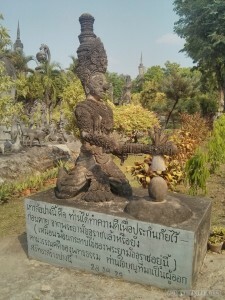 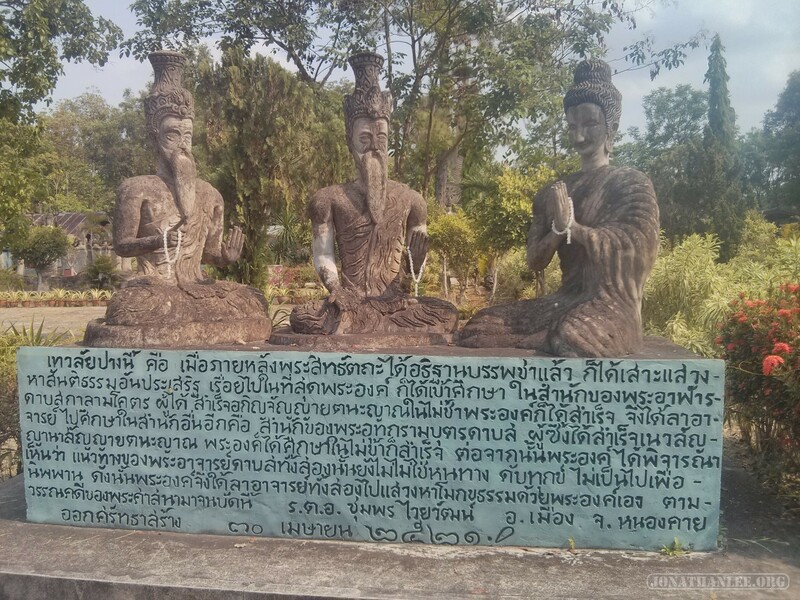 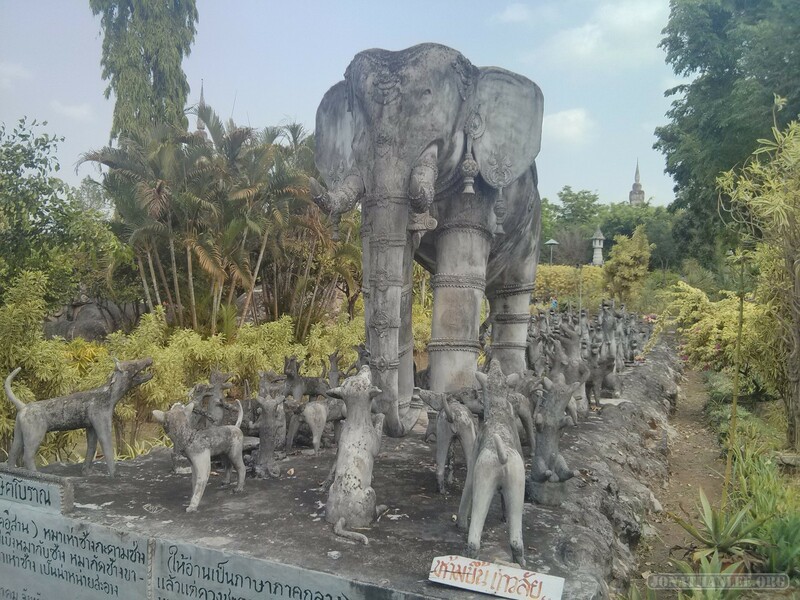 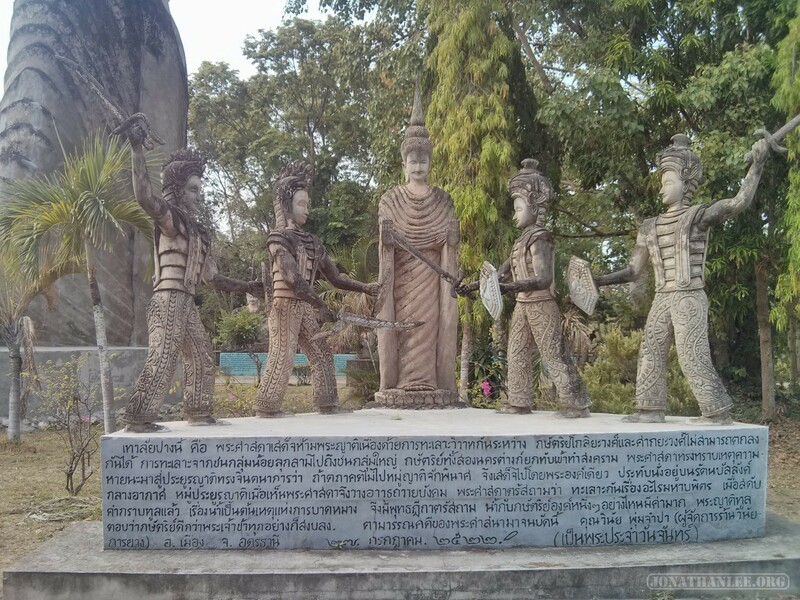 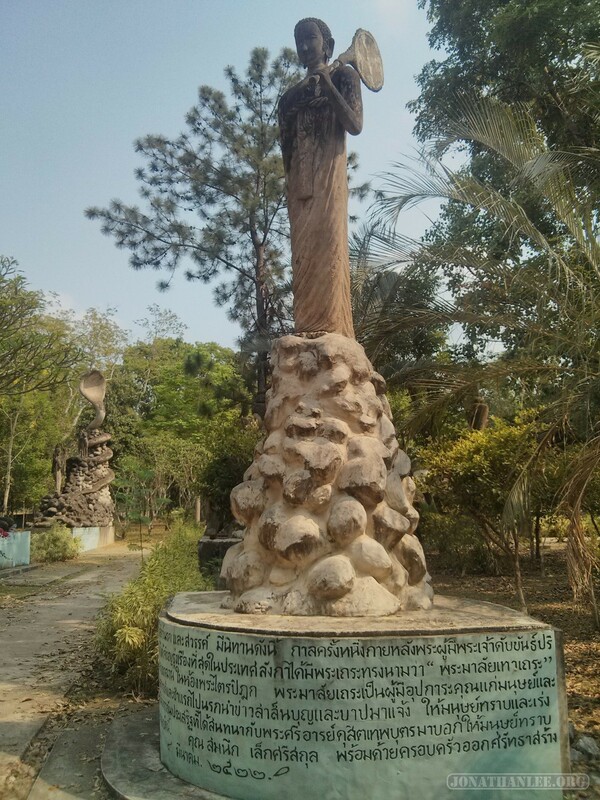 Each of the sculptures had a title (in Thai, which I couldn’t read), so I just gave them my own names! Kind of like MST3K – Mystery Sculpture Theater 3000! 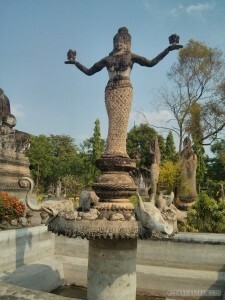 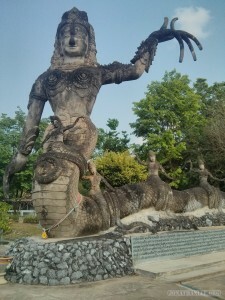 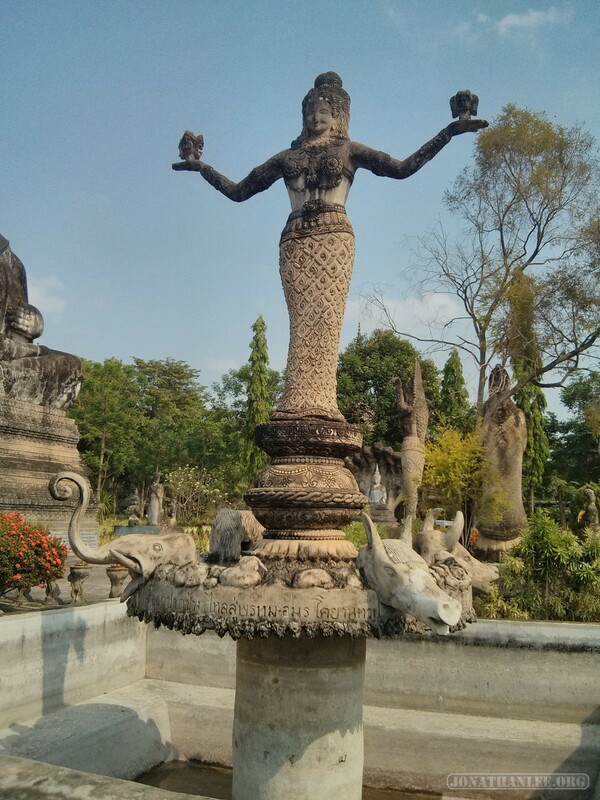 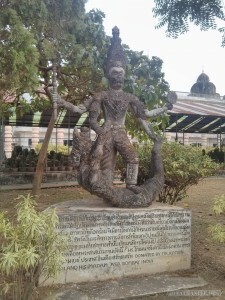 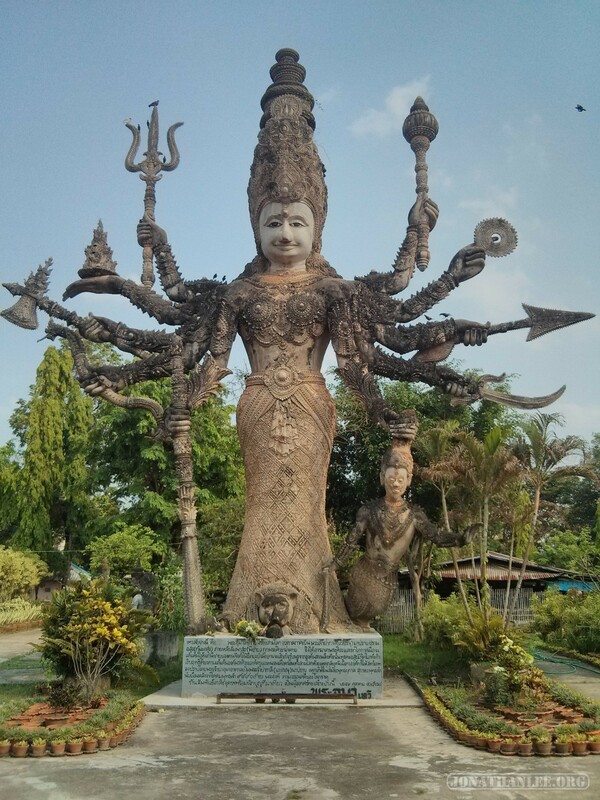 Half human, half fish – mermaid or naga? 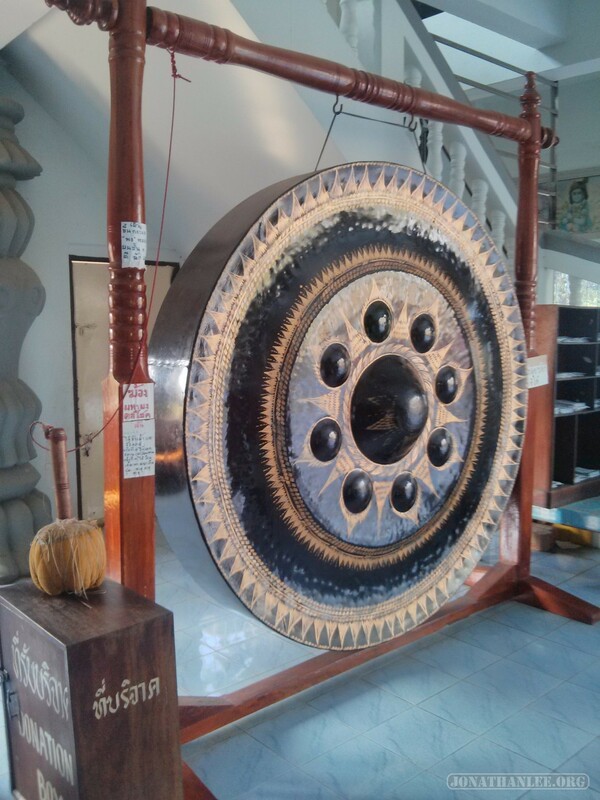 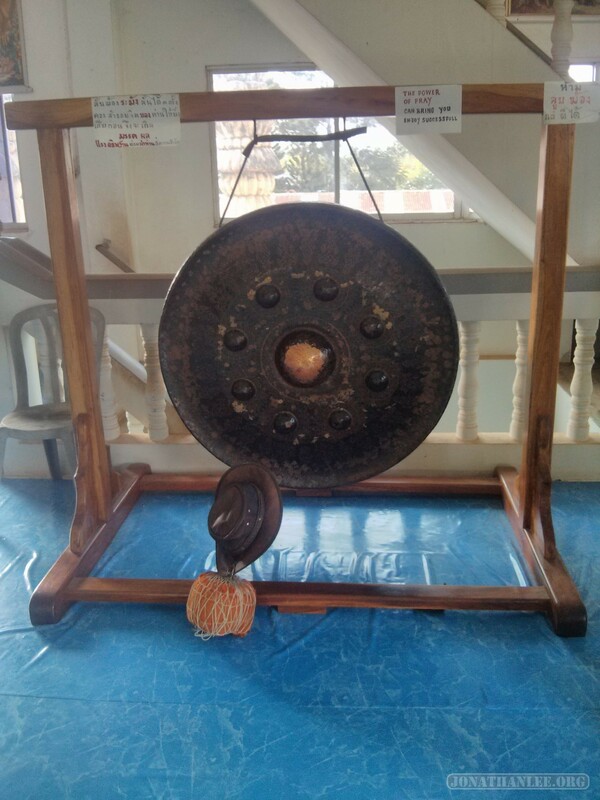 There was also a small temple of sorts attached to Sala Keoku, which was pretty unimpressive, except that they had these huge gongs you could ring! It’s amazingly satisfying, to take a large mallet, and just thump away at the gong. 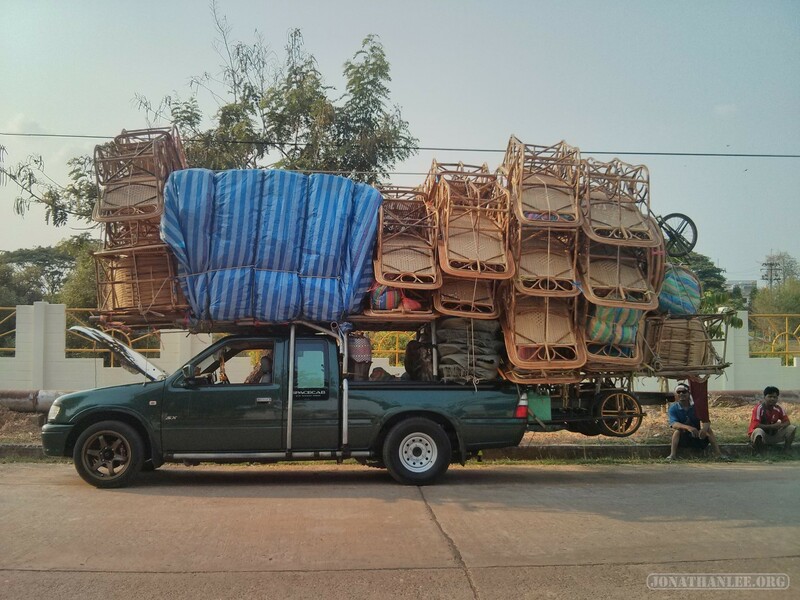 GONNNNGGGG. 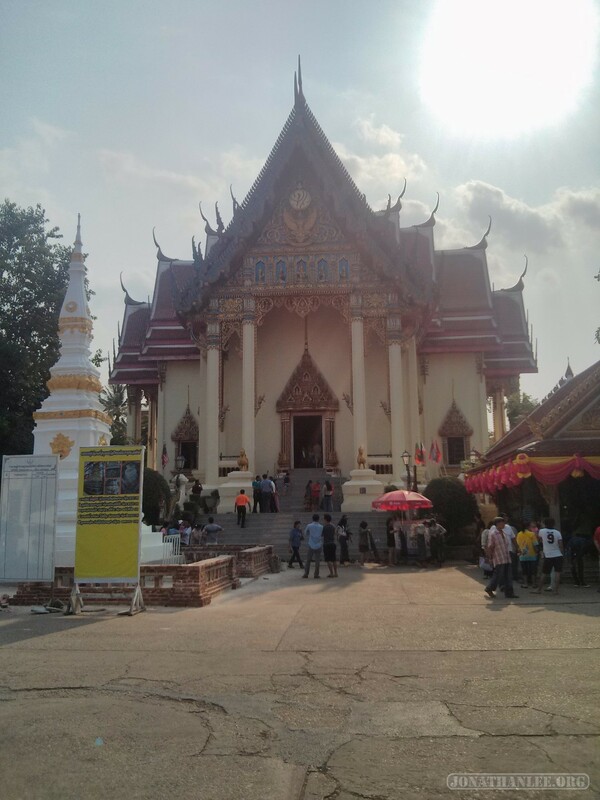 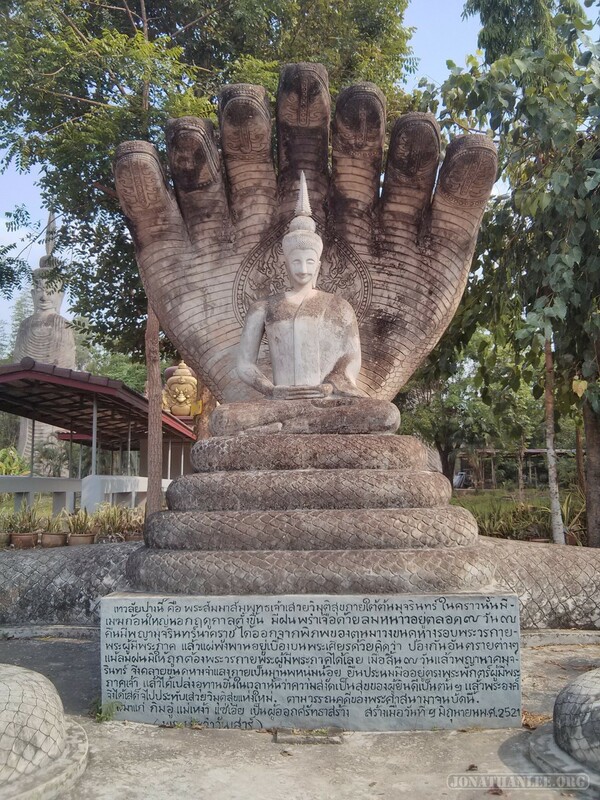 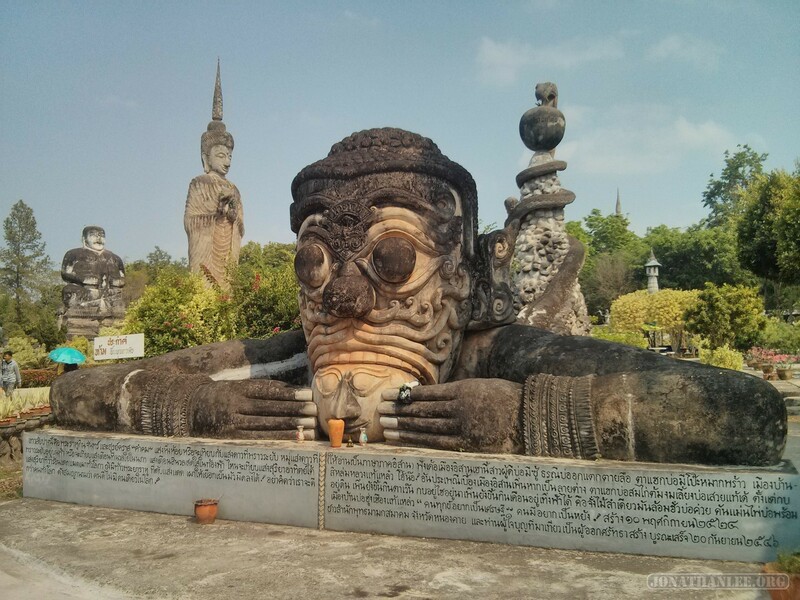 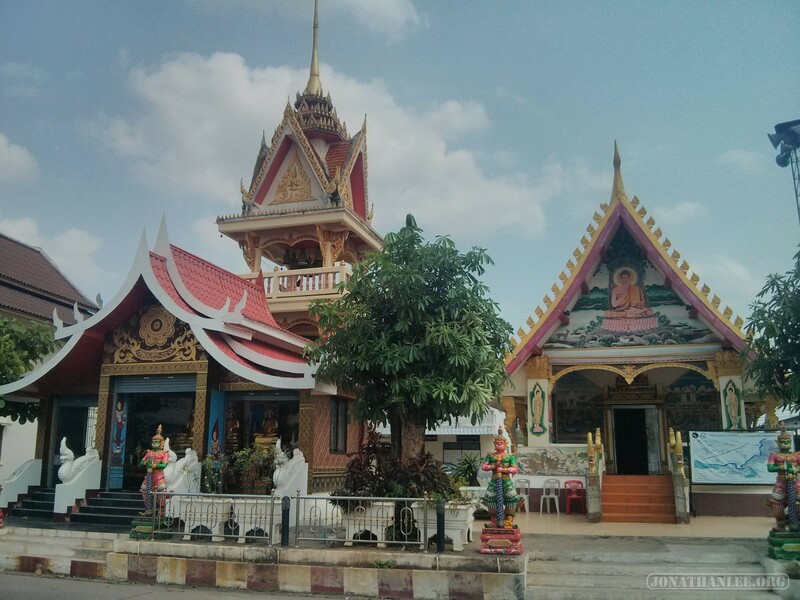 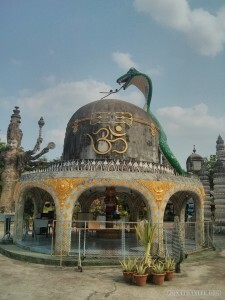 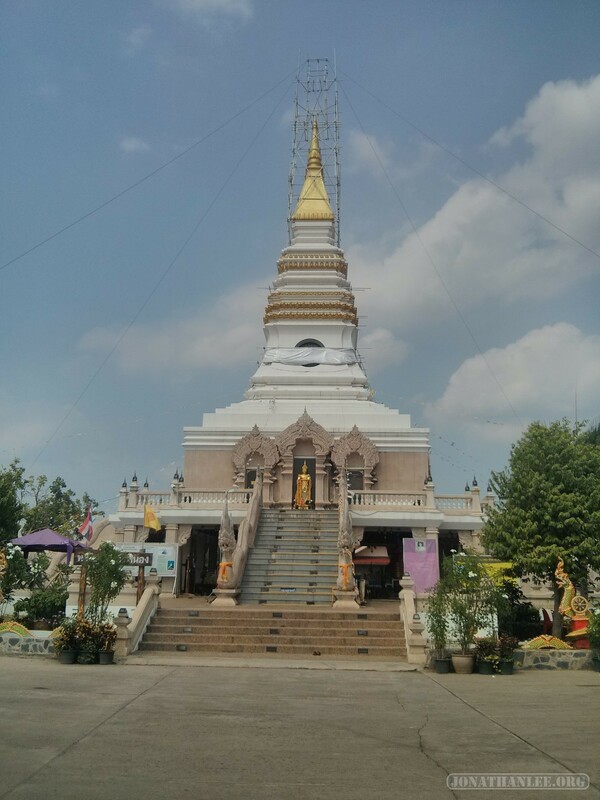 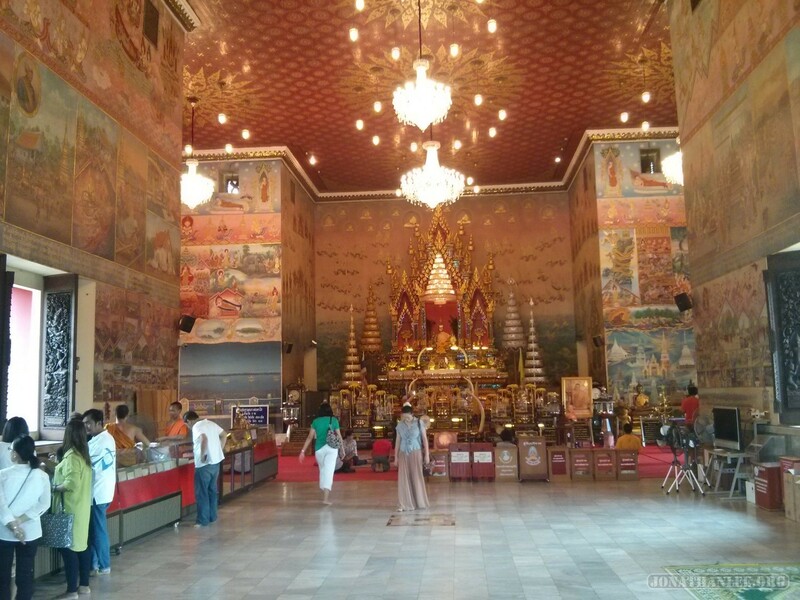 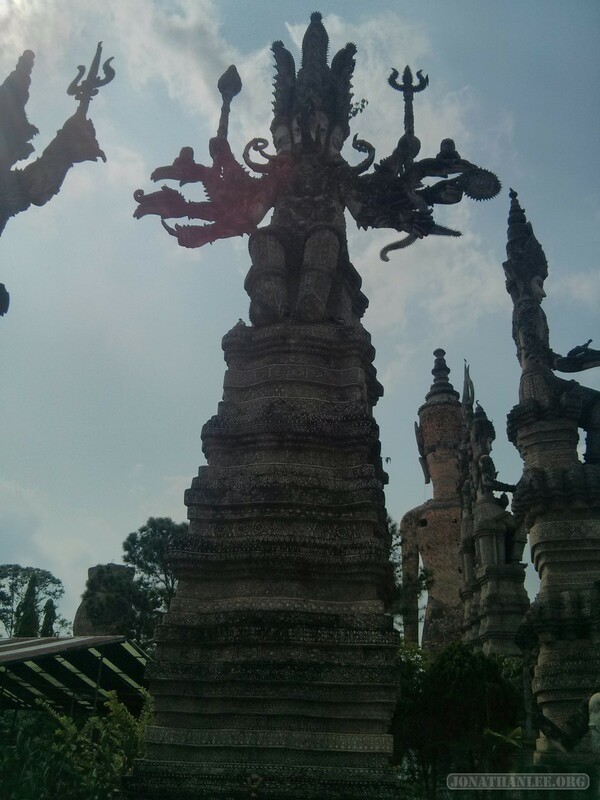 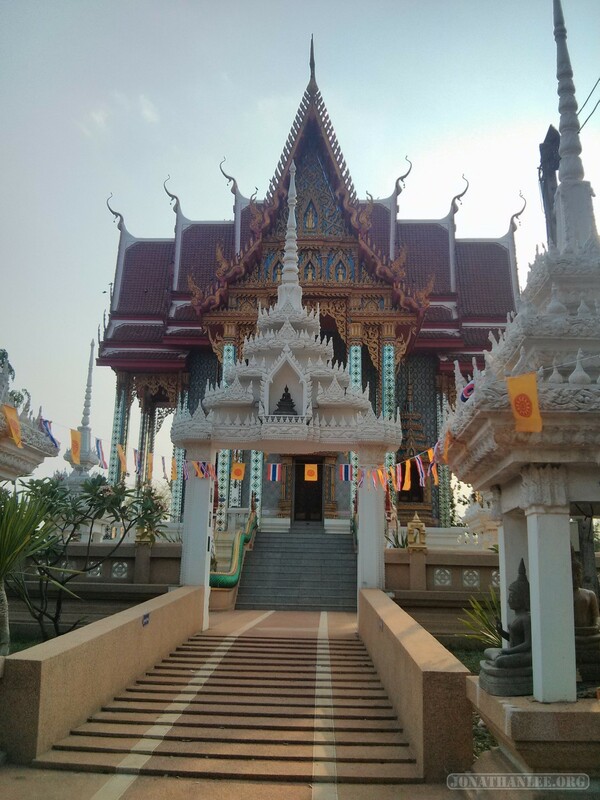 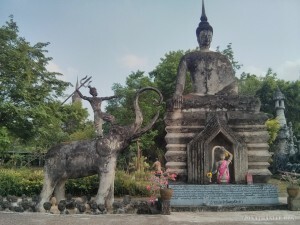 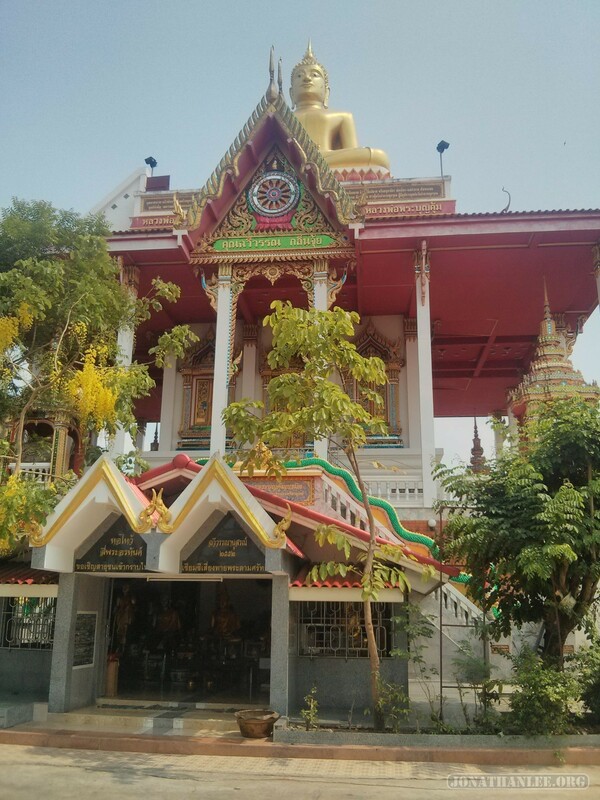 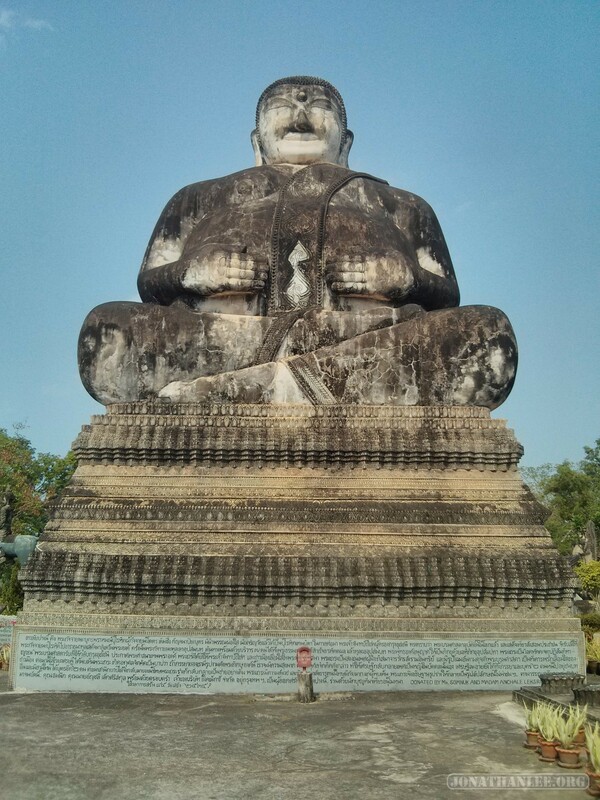 Wat Phochai: apparently a pretty big temple in Nong Khai. 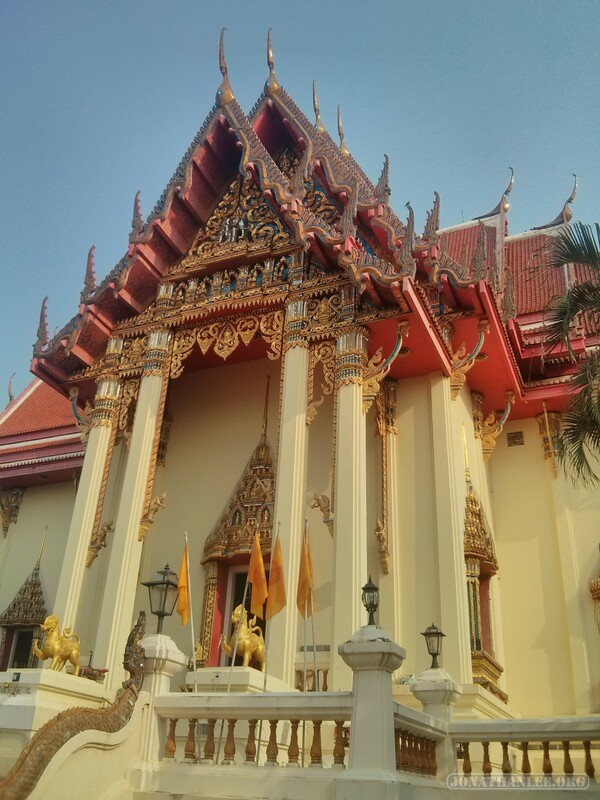 The outside is somewhat unremarkable for a temple. 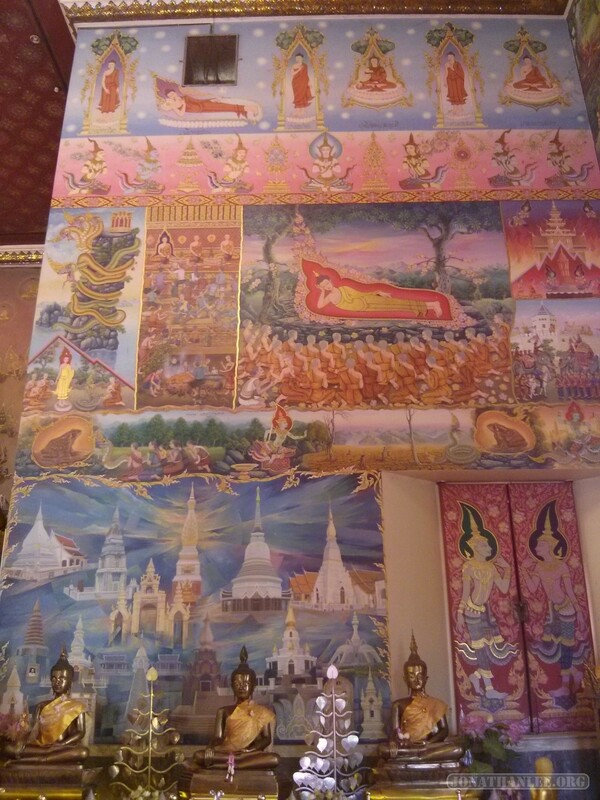 However, what’s really cool are the murals all over the entirety of the building’s inside. 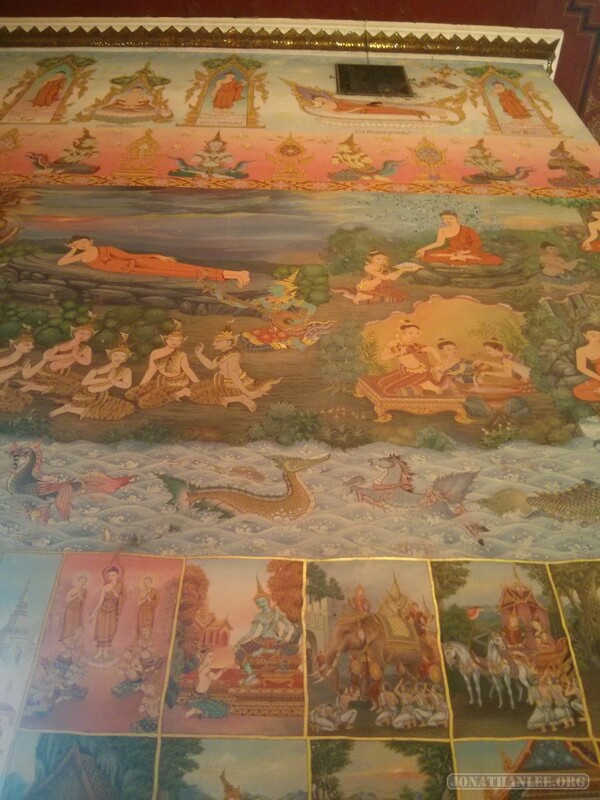 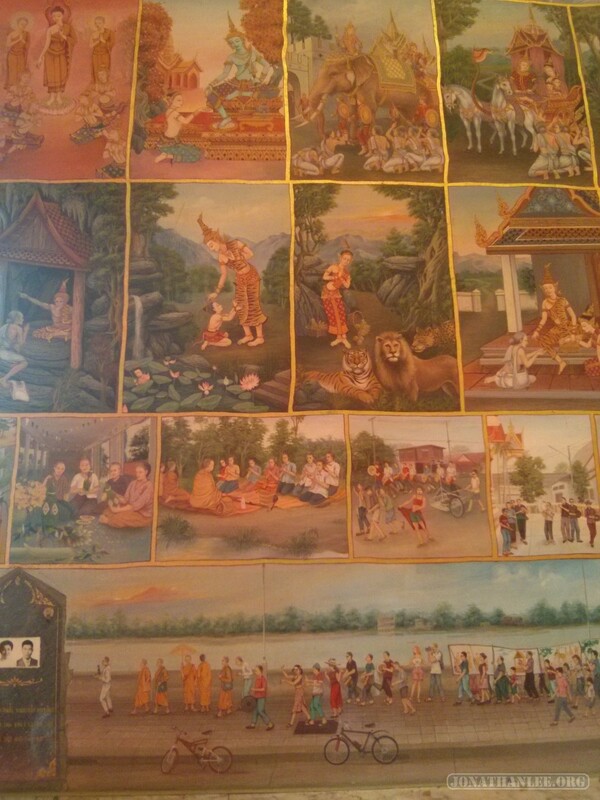 At the bottom of the murals are the depiction of everyday life in Thailand – villages, markets, everyday people, and even visiting tourists. 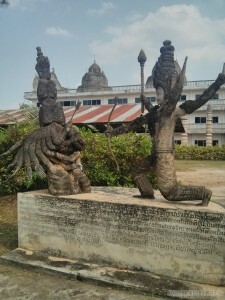 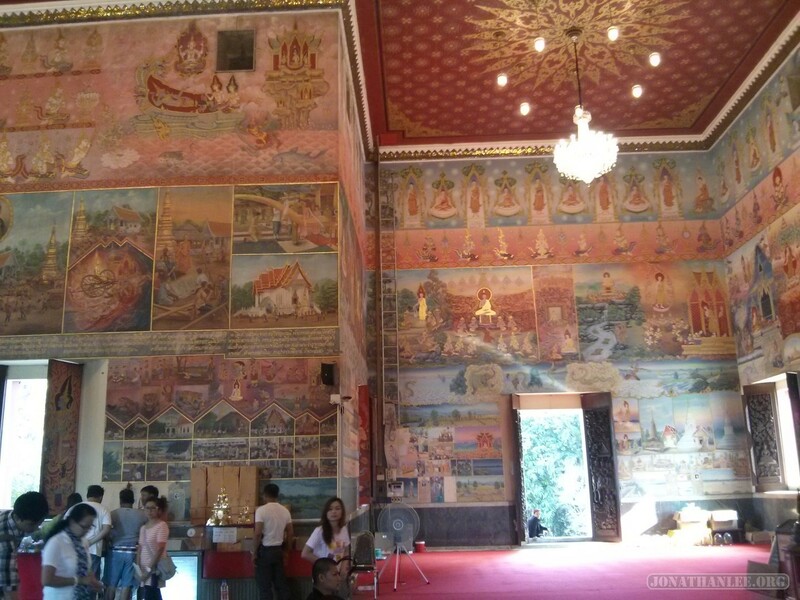 As you move up the wall, you see more spiritual landscapes, with lots of temples, etc. 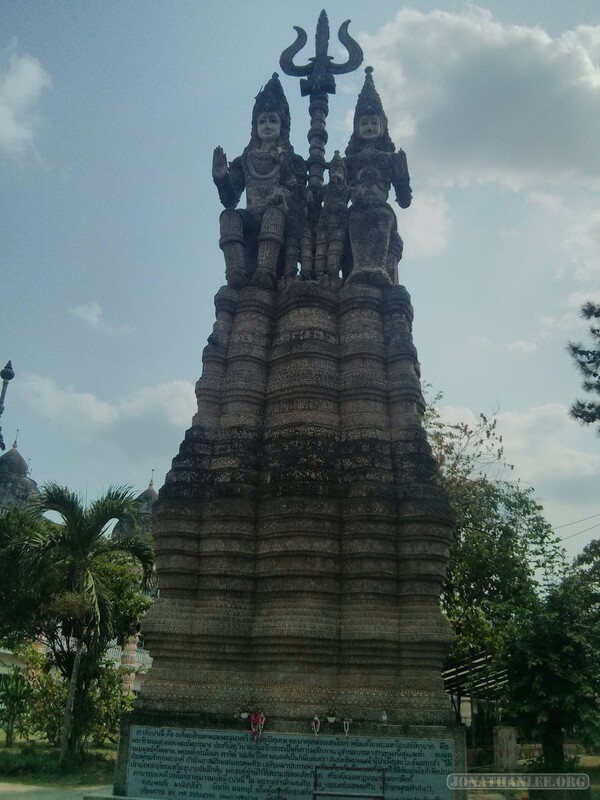 And finally, at the top, you have the gods! 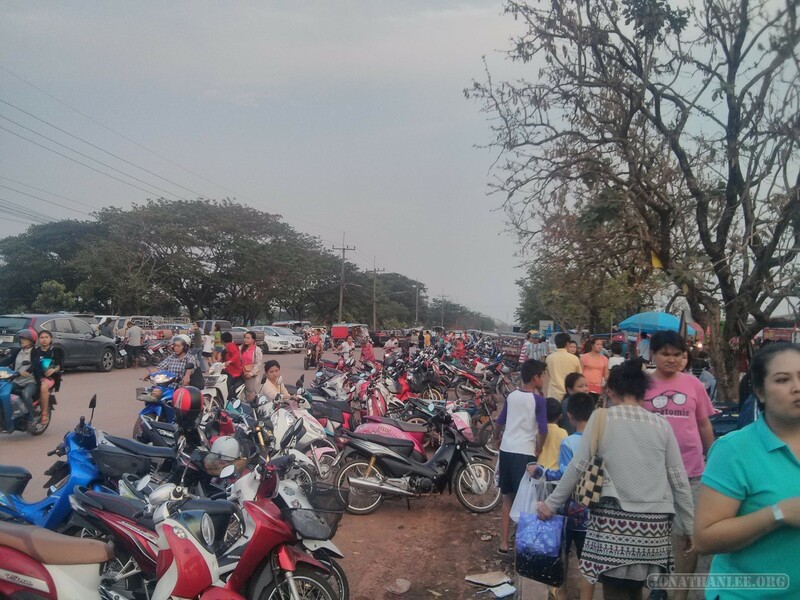 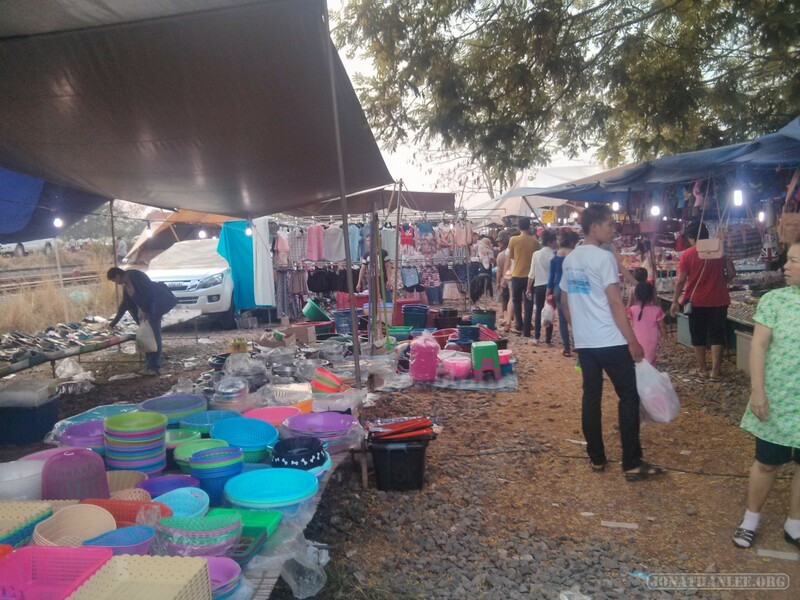 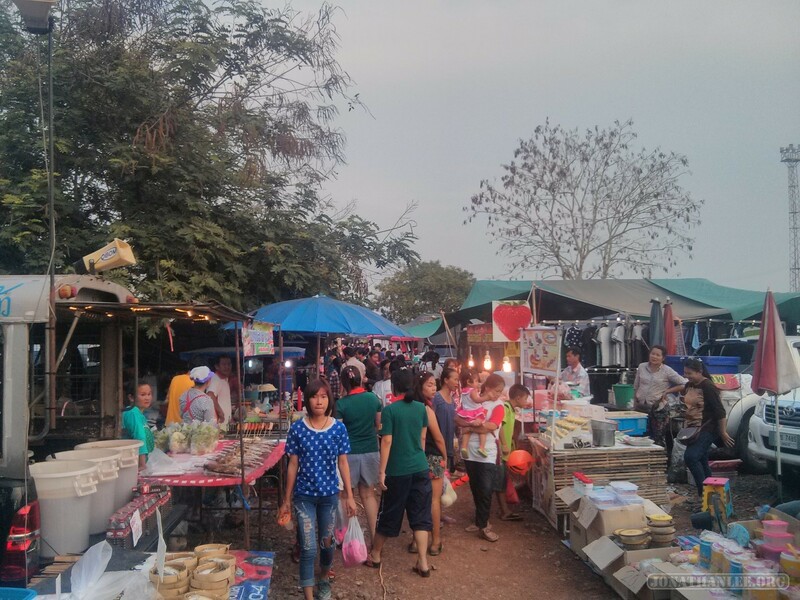 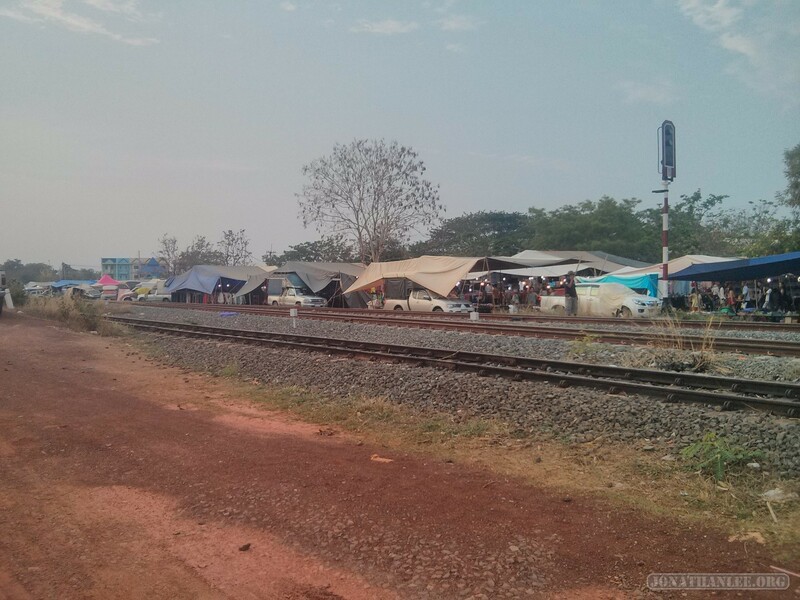 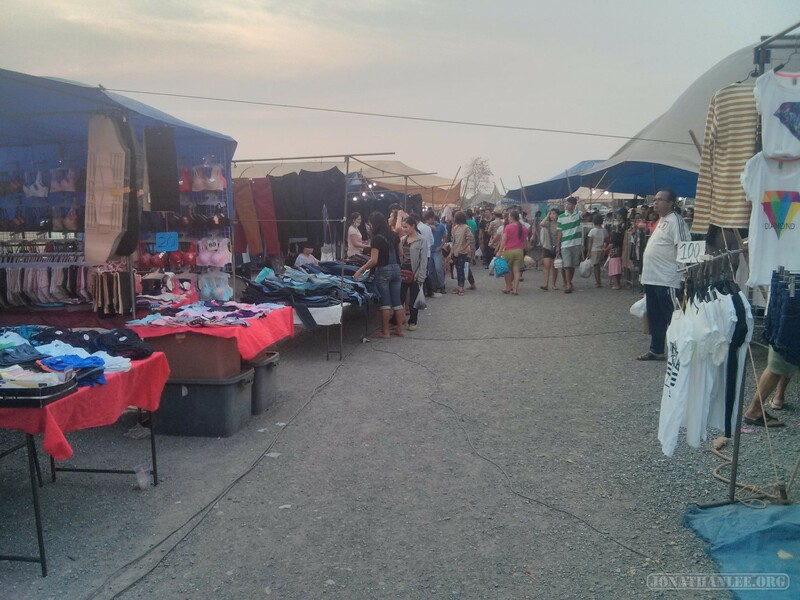 Finally, before boarding my train back to Bangkok, I visited Nong Khai’s Sunday Walking Market – basically, a huge impromptu market that pops up every Sunday on a large field near the train tracks. 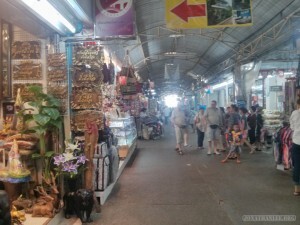 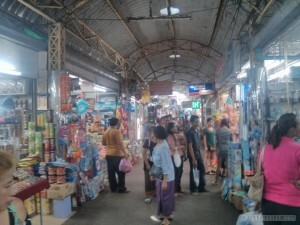 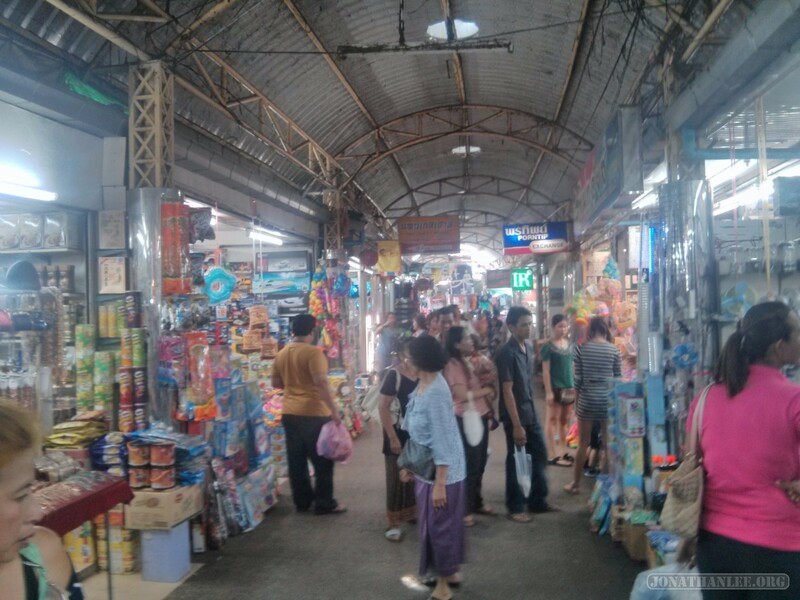 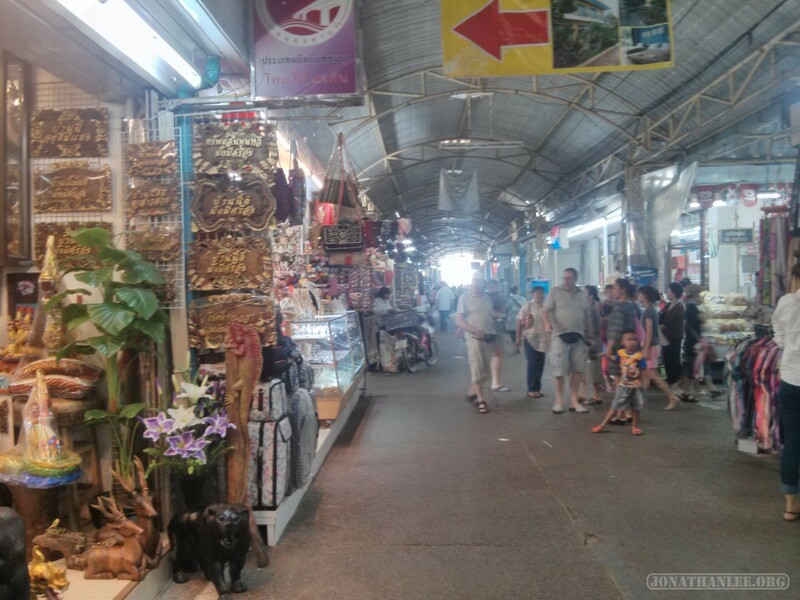 And I was quite impressed, especially when comparing this market to the one in Chiang Mai. Whereas the one in Chiang Mai was flooded with tourists, and sold mostly useless trinkets, this one seemed more my style – almost all locals in attendance, selling more useful items (and delicious food for my train ride) instead of souvenirs. – An old man sweeping the train tracks. 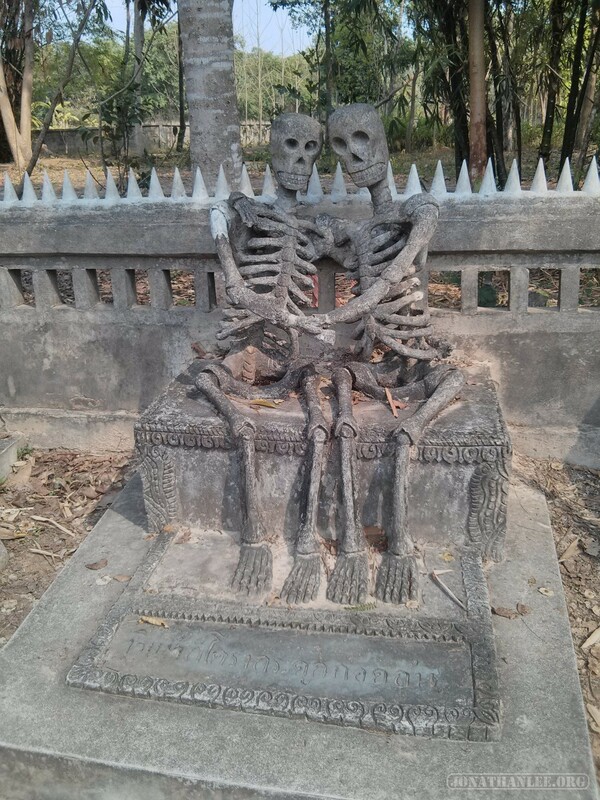 I can’t say why this caught my eye, but it did.